It’s the summer of 1983 “somewhere in Northern Italy,” according to opening text of “Call Me By Your Name,” and Elio (Timothee Chalamet) and his academic parents (Michael Stuhlbarg and Amira Casar) take in an American doctoral student named Oliver (Armie Hammer) to assist Elio’s father with research. Immediately, Elio and Oliver get off to an icy start. Elio finds himself both repulsed and attracted to Oliver’s swagger and confidence. Eventually, it is revealed that the two are attracted to each other and the rest of the film is spent exploring their relationship. There’s a lot of juxtaposition between civilization and nature in the film, which draws attention to the transformative element of it. Primal sexual desires begin to appear in areas that are wild and untamed. This is notable in how the camera lovingly captures the wilderness and will spend time just lingering on nature, taking in every single chirp and creek. Great care was put into the cinematography. This is due in part to the time period the characters are in, but also in order to represent the primal nature of desire. Elio and Oliver visit the river and other places in nature several times throughout the film, with nature becoming a conduit for these two men to finally submit to the attraction that exists between them. This is seen especially in the trip the two take to Bergamo, on the recommendation of Elio’s parents, who are quietly aware of the relationship, as well as the peach scene. Elio and Oliver are seen excitedly yelling through mountains, the happiest the audience has seen them because they are free to be with each other. The title is clever in that it gives insight into Elio and Oliver’s relationship. They say each other’s name to show their love because they could be the same person; they complete each other. One of the nice things about “Call Me By Your Name” is the way it circumvents clichés that are usual in gay love films. There might be a character who opposes the relationship or someone who is explicitly homophobic. Thankfully, there is no villain in the film. If anything, the villain is time. The relationship is tragically short and transitory, since it takes them such a long time to fall in love. As mentioned before, Elio’s parents are accepting of the relationship. If it was another film, we might have seen Elio’s parents discussing why the two cannot be together. Here, we get a beautiful monologue delivered by Stuhlbarg near the end of the film that is absolutely devastating in its earnestness. The performances are the strongest aspect of the film. Chalamet is having the best year of his career yet with his starring role here and his strong supporting role in “Lady Bird.” He brings a quiet intelligence to Elio that is an interesting juxtaposition to the character’s emotional insecurity and immaturity. The way he seamlessly transitions from speaking English to Italian to French is captivating. Elio also spends a lot of his time playing the piano, requiring Chalamet to play the same song on the piano slightly differently each time; he’s incredibly skillful. It’s a testament to the dedication he gives to the role. Hammer gives the best performance of his career as Oliver. It’s especially surprising how much he can communicate with a simple touch or a smile, and it lends itself beautifully to the second half of the film in which he is required to almost deconstruct Oliver and show his vulnerability. 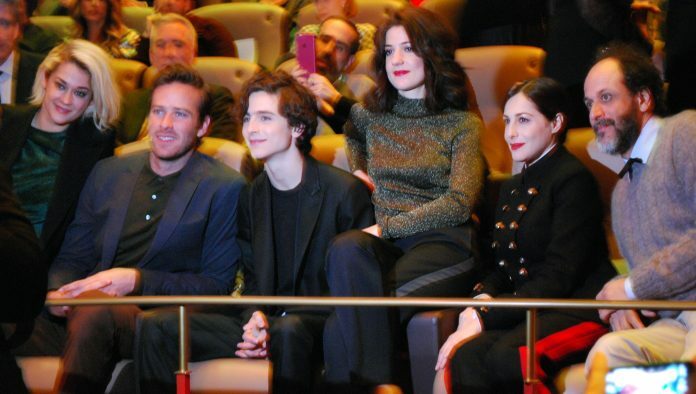 Esther Garrel as Marzia, a local girl that Elio has a short fling with, also deserves praise for adding complexity to a character that could have simply been an afterthought. “Call Me By Your Name” is romantic and dripping with passion. Strong direction and strong performances result in a film that is as sumptuous and lavish as the peaches in it. Whatever you do, stay for the entirety of the ending credits. I do not know how Chalamet and director Luca Guadagnino pulled it off, but the final shot of this film is haunting and must be seen. And if you need any added incentive, there is a lovely Sufjan Stevens song for you to listen to while you wait.